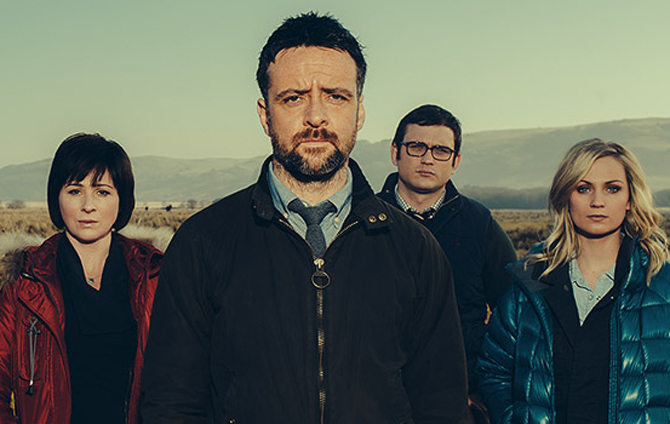 The latest crime noir drama to hit our screens is Y Gwyll/Hinterland, which has been snapped up by Danish broadcasters DR Denmark, who first broadcast The Killing and Borgen. 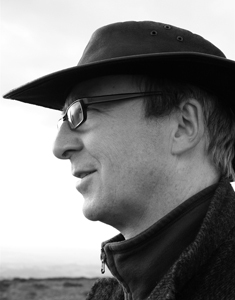 John Hardy, the College’s Head of Contemporary Music, was commissioned to write the score for the show, which has been filmed in Welsh and English. And he worked closely with two recent graduates from the college – Victoria Ashfield and Benjamin Talbott – to compose the score. Here, John tells us about the process. “It has been a rollercoaster – I know it sounds like a cliché, but it’s the truth. “I was first approached about creating a new and distinctive musical sound world for Y Gwyll/Hinterland back in June 2012, and after many discussions and explorations, listening to music for various films, TV series, and a wide range of colours from around the globe, on the radio and on CD, I decided it would be possible to make something special. But I knew I would need help – I needed one or more people who were highly trained in specialist recording techniques, who could work with sophisticated sound manipulation, and who had the right combination of qualities to support such an ambitious and exciting international creative project. “I knew the team would need to be able to work under great pressure – the schedule from arrival of finished edited episodes to the delivery dates for finished music was tight. Each episode is 96 minutes, the same length as the current Hollywood movie Gravity – and we would have just over six months to finish the music for four films, each the same length as that movie. Except that there would need to be a version of the music that would fit the Welsh language version, as well as the English/International version, of each of the four dramas. “And with each of the stories being so distinctive and so particular, the kind of musical atmosphere, episode-specific themes, and moment-by-moment underscore, a lot of the basic work to establish the correct tone had to be done four times, once for each episode’s story and location. “So where do you go to find members of a team who can contribute fully to such a specific and difficult process? Well, actually, to RWCMD! I approached two people about whom I knew quite a lot – at the time of starting, they were still fourth year students in Creative Music Technology within the Contemporary Music (Composition) Department. I had already worked closely with them both, one in helping me to create music for the National Theatre Wales’ performances of Coriolan/us and the other in a collaborative element of the Welsh Cultural Olympiad, Cold Rolling – Adain/Avion – in Ebbw Vale. “I also knew that they were old friends, and could work with each other without too many sparks flying. “So I invited Benjamin Talbott and Victoria Ashfield to join me in the slightly scary but very exciting process of creating, from scratch, a sophisticated and tightly composed soundtrack for an international police drama series. I’m glad to say they agreed, and although it was tough, exacting, and a huge test of resolve, endurance and emotional resilience for us all, it was also thrilling and uplifting, and – for me, at least – a truly happy period of feverish creativity. “I won’t go into too much detail here about the precise processes and principals of composition. But I can reveal that we all agreed early on that we should try to record as much live music as possible, that microphones should be as close as possible to instruments and singers, to capture the naked, grainy, human quality of real sounds. And that we would try to find a musical world that could equal the extraordinary landscapes, characters and stories of West Wales which the series manages to conjure up – timeless, elemental and, sadly, fast disappearing. “I am massively indebted to Benjamin and Victoria, who have cut their teeth on this ambitious project with courage, commitment, deep professionalism, and open-minded creativity. I could not have asked for more.